The Process doesn't forget, Adam. 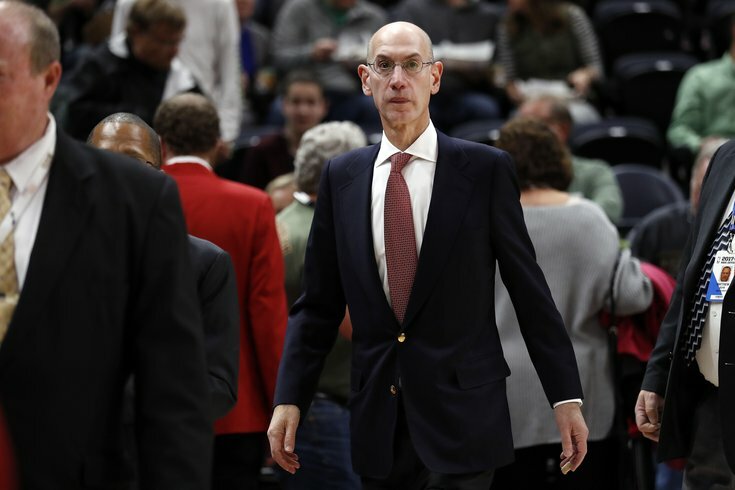 UPDATE: An NBA spokesperson reached out to PhillyVoice to comment on Michael Weber confronting Commissioner Adam Silver at the Sixers' playoff game Saturday. The spokesperson said Silver wasn’t bothered by the confrontation and returned to his seat in the second half. The spokesperson also said that no security escorted Weber away. Weber, for his part, did note that Silver returned to his seat for the fourth quarter. One small correction: Dave Silver eventually came back to his seat in the 4Q. Which was great b/c then my buddy & I were able to make eye contact with him when the building erupted into TTP chants. He squirmed more than The CEO. Michael Weber is a screenplay writer whose resume includes "(500) Days of Summer," "The Fault in Our Stars" and "The Disaster Artist." He's also a diehard Sixers fan who is considered the Spike Lee of the "only" podcast about the team, "The Rights to Ricky Sanchez," hosted by WIP programming director Spike Eskin and television screenwriter Mike Levin. Before explaining what Weber did at the Sixers' Saturday night home playoff win against the Miami Heat, let's have a quick Process history refresher, shall we? Sam Hinkie, the former Sixers general manager who orchestrated The Process (a term originally dubbed by the RTRS podcast), was essentially forced out by NBA Commissioner Adam Silver in 2015 at the urging of other owners. Which seems funny now, considering about a third of the league is doing pretty much the exact same thing that Hinkie did — tanking in an effort to acquire high draft picks — just with less long-term vision and strategy. Anyway, Silver was at Saturday night's game. So was Weber, who Eskin described as the most "confrontation" Process truster. Wearing a "Hinkie died for our sins" shirt, he decided to give Silver a piece of his mind. Silver's sitting in the stands. Weber decides that he's going to go up to Silver and give him a piece of his mind about The Process and forcing Hinkie out. So, Weber wanted to be really clear to me that he did not yell at Adam. He thought it was important he remain calm and just talk. But he's wearing a T-shirt that says "Hinkie died for our sins," and he goes up to Silver — and there's a picture of it... and he tells Silver [Eskin quotes Weber's tweet about the confrontation] and then Silver didn't come back to his seats for the second half! And I guess Weber was ushered away or asked to keep moving by building security. Dave Adam probably hopes the Sixers don't make it to the NBA Finals. Because if they get that far, that means more games in Philly he has to attend. Not all Process trusters are as cool and collected as Weber. And none of them forget.